More and more VFD applications increasingly demanding requirements: fast, but, gentle acceleration, gentle, but rapid and precise braking as well as the ability to accommodate even unpredictable loads with ease. In order to satisfy these primary requirements, but also to meet many other criteria reliably, not only the motors, but also the VFDs have to offer special characteristics. already integrated line reactor in the VFD to reduce the need for cabling and wiring, an optional line filter can also be integrated. the VFD integrated speed and torque monitoring. Direct Torque Control enables the VFD to implement a wide variety of highly dynamic operating sequences. The entire output capacity of the VFD can be utilized. The VFD control system ensures that process sequences remain smooth, precise and reliable, even under arduous operating conditions. The is the right solution if the application requires variable travel, lifting, turning and slewing motions, regardless of the given load. The VFD exact torque control provides a constant torque, even at low frequencies. This means that VFDs always start smoothly and offer unmatched precision controlled braking. This solution not only offers reliable protection for the loads to be transported, but also ensures the safety of the installation. This control variant enables a constant speed to be maintained, even if the load fluctuates widely. The torque is exactly adapted to the give load for the specific speed setting. In this way, the required performance level of an installations achieved at all times and under all operating conditions. This is decisive in the case of machinery where product quality depends on a constant speed. In these drives applications, Gozuk VFD satisfies all requirements with the integrated speed and fast torque control. 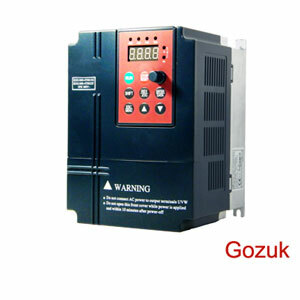 Due to its short VFD control rise time, Gozuk VFD responds very quickly to changes in load or external factors such as wind forces acting on cranes outdoors, for example.